The outreach is part of the group’s Recycle Responsibly campaign. While education is needed on many different recycling issues, the problem of plastic bags in residential recycle bins is the highest priority. 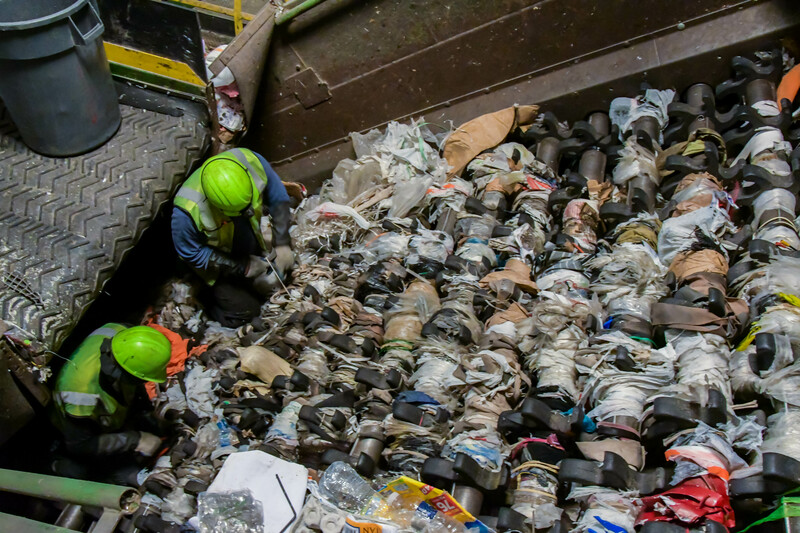 In addition to putting workers at risk, plastic bags often ruin baled paper and other items that could otherwise be recycled. Many people like to bag their recyclables and then put them in their recycling dumpster or rollcart, still in the plastic bag. This is also harmful. All plastic bags must stay out of recycling bins, Greathouse said. Participating stores for Plastic Bag Awareness Day include all four Straub’s locations (Central West End, Clayton, Webster Groves and Town & Country), Local Harvest in South St. Louis, Pete’s Market in University City, Lucky’s in Rock Hill, the Fenton Walmart, and the Kirkwood Dollar Tree. Dierbergs has signed on as a partner to promote the plastic bag awareness message in store signage and on social media and their website. Various business districts in the region, including The University City Loop, Kirkwood, South Grand, Maplewood and Clayton, are also giving out reusable bags or other discounts or prizes in partnership with this educational campaign. Stores in the Loop in University City are offering the first 500 guests a free trolley ride ticket when they bring their own shopping bags. In South Grand, visitors can snap a photo using a reusable bag and tag @SouthGrandSTL and @BrightsideSTL to be entered to win a $50 gift card to a South Grand store of your choice. Other stores along South Grand will have specials for shoppers with reusable bags, too. Stay up to date with Plastic Bag Awareness Day promos and freebies on Facebook at OneSTL. For a list of plastic bag recycling drop-off locations, visit RecycleResponsibly.org and click on the link to Plastic Film Recycling. While plastic bags may be convenient, they cause a number of problems for people, wildlife and the environment. Plastic bags used in St. Louis end up in our oceans and coastal areas, as they wash down storm drains or blow into our streams and rivers leading to oceans. This pollutes and harms wildlife along the way. According to the Center for Marine Conservation, plastic bags are among the 12 items of debris most often found in coastal cleanups. Hundreds of thousands of turtles, birds, whales and other animals die every year from eating discarded plastic bags mistaken for food. From a public health standpoint, plastic bags clog gutters and storm drains, causing water and sewage to overflow and become a breeding ground for disease-resulting in germs, bacteria and insects, like mosquitoes. It is more important than ever to prevent plastic bags from becoming litter which makes our neighborhoods look bad and causes these health risks. Wendt added that educating consumers about what can and cannot be recycled in their home has become critically important. She encourages the public to find out more by visiting RecycleResponsibly.org and by following OneSTL on Facebook, Twitter and Instagram. OneSTL is a regional collaboration that focuses on a sustainable future for the St. Louis region. The OneSTL Materials and Recycling Working Group includes the following entities: St. Louis-Jefferson Solid Waste Management District, City of St. Louis, St. Louis County, Jefferson County, Madison County, City of University City, Brightside St. Louis, EarthWays Center of Missouri Botanical Garden, Republic Services, St. Louis Composting, EarthDay365, Green Dining Alliance, Recycling on the Go, University of Missouri-St. Louis and Washington University, and East-West Gateway Council of Governments. For more information, visit http://www.OneSTL.org. This entry was posted in Environment, Local Events. Bookmark the permalink.